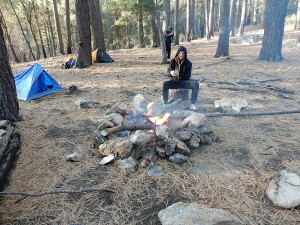 This was my first backpacking trip in over 10 years. I went with my buddy Joe, who’s about the same age as I, and we took the 15 year old son of a friend who couldn’t go due to back problems. Ryan is a good kid, in great shape, and has a great attitude. And who has a fondness for aluminum foil. 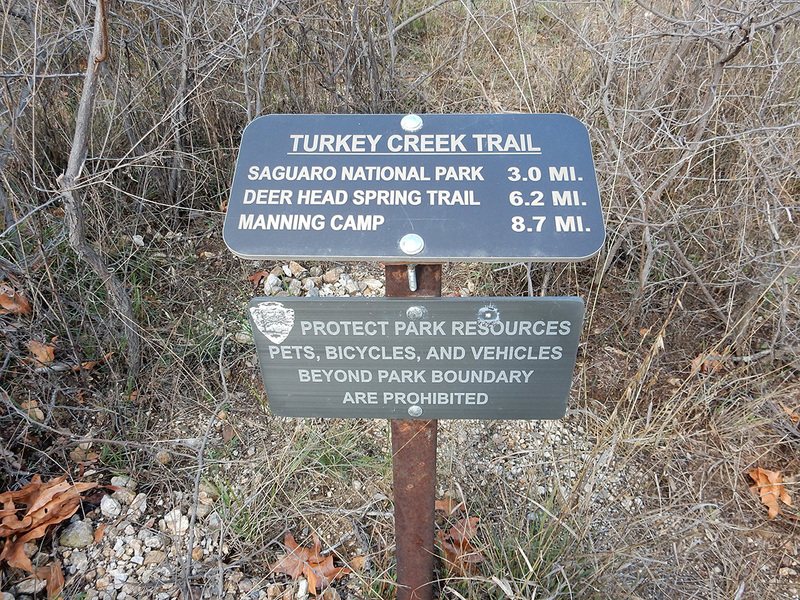 Sign at the primary trailhead at Miller Flat. Our destination was the Spud Rock Spring campsite by way of the Turkey Creek Trail, located in the eastern side of the Rincon Mountains, in the Saguaro Wilderness Area of Saguaro National Park. From the eastside of Tucson, it’s about a 2 hour drive east towards Benson, getting off Interstate 10 at Mescal. 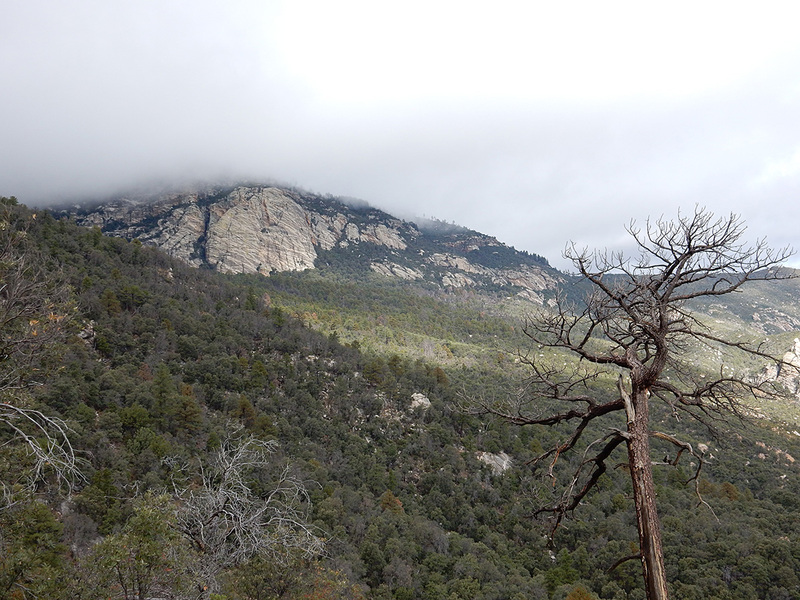 From there, you head north into the Coronado National Forest to the Happy Valley area on Forest Service road 35. 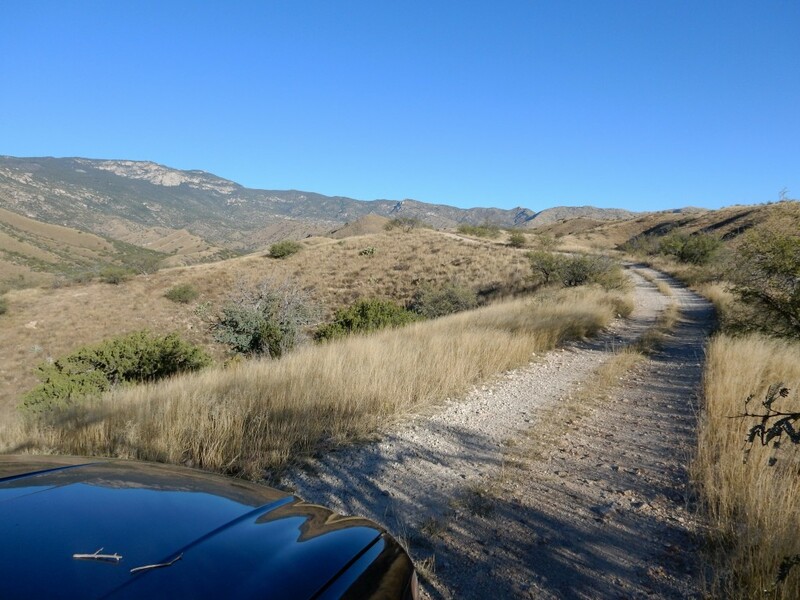 If you don’t have a high clearance four wheel drive, you have to park at Miller Flat and walk an extra 1.5 miles or so up FS 4408; otherwise, you can proceed through a gate and park at the end of FS 4408 to start the hike. 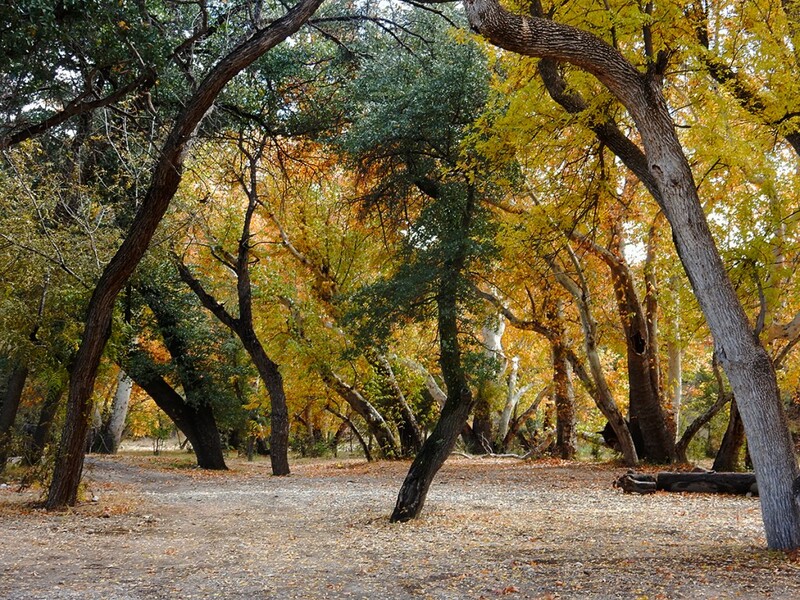 A great place to car camp at Miller Flat in Happy Valley. Heading up Forest Service road 4408 to the secondary trailhead. This road is suitable for high clearance 4WD vehicles only. We left Tucson at 6:30 on Friday morning and arrived at the trail head in Happy Valley around 8:20 AM. Joe has a Jeep Liberty, so we were able to get the end of Forest Service road 4408 to start our journey, rather than having to park down the ridge and hike another 1.5 miles in. The weather was great, though still chilly at this time of morning – 36 degrees and clear. We hit the trail at 8:45, quickly shedding a couple of layers as we warmed up from the sun and exertion. Joe and Ryan amid tall grass on the Turkey Creek Trail about 1.5 miles from the secondary trailhead. 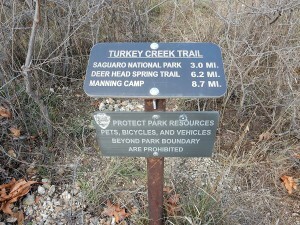 For the first couple of miles, the trail climbs slowly through savanna grasslands and oaks. After that, it was a slog for pretty much the next 3 miles. 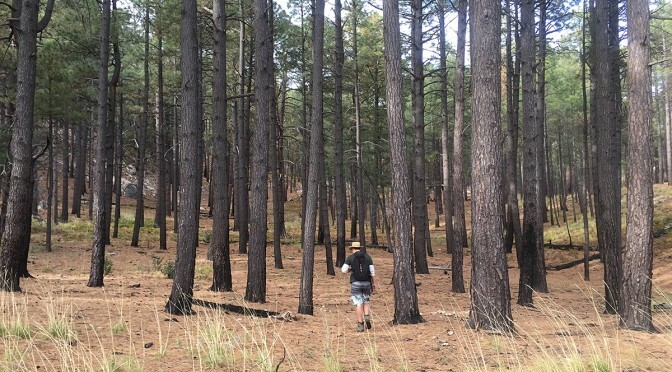 It was like doing Blackett’s Ridge in Sabino Canyon twice. We stopped frequently to catch our breath, as well as to enjoy the view and take photos. At Mud Hole Spring, we ate lunch and took a half hour nap. It was evident that this trail doesn’t get much use. It was overgrown almost all the way up, and in many spots, felled trees crossed our path. Near the end, about 3/8 mile from Spud Rock Spring, we spent about 20 minutes trying to follow the trail, due to overgrowth and debris on the trail. We finally arrived at the campsite at 5 PM. Of the three sites available, we made ours nearest the pit toilet and the bear box, which served double duty as a camp table. 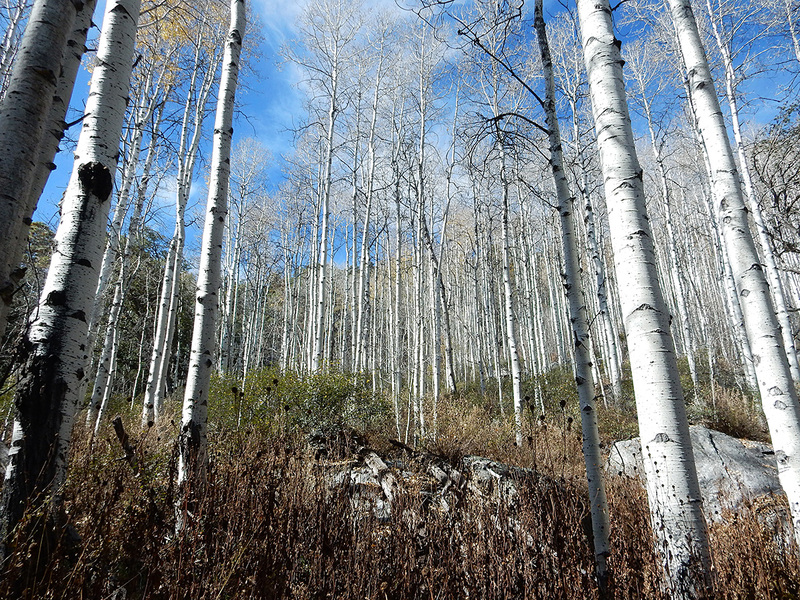 There was ample firewood about, but the no water at the spring, just a wet bog, surrounded by a large grove of aspen trees. Even if there had been a flow, the ranger had told Joe it was not good for drinking. The ranger had also told Joe that we would be by ourselves on Friday night, but that the other two sites would be occupied on Saturday. We thought this odd, given it was November, it was the far side of the Rincons, and the threat of inclement weather loomed. Ryan contemplates uses for aluminum foil by the camp fire. All of us had frozen meat with us (2 steaks and 2 chicken breasts) that had thawed out nicely during the day. We cooked these on small wire we had brought along, and supplemented these with baby carrots, dinner rolls, potatoes, and nuts. Ryan had not brought any plateware. Rather, he had a roll of aluminum foil. He took a flat piece of rock, and covered it with foil, using this as his plate. After dinner we made hot chocolate while a roaring fire danced before us. Ryan did not have a cup. Using mine as a mold, he fashioned one out of foil. We called it a night around 7:30. The night time temperature was quite pleasant, with almost no wind during the night. Aspen grove at Spud Rock Spring. Saturday morning found us getting up around 7 AM. Quickly Ryan made a fire (he being 15, the fire was much larger than it needed to be, but boys will be boys) and we went about making coffee and breakfast. We spent most of the morning sitting around the fire, taking a nap mid morning, before getting our act together and heading over to Devil’s Bathtub to procure water. We missed the trail for the most direct route, taking a route that led us to a farther south meeting with the Heartbreak Ridge Trail, causing us to have to climb back up 500 feet, rather than staying fairly level. 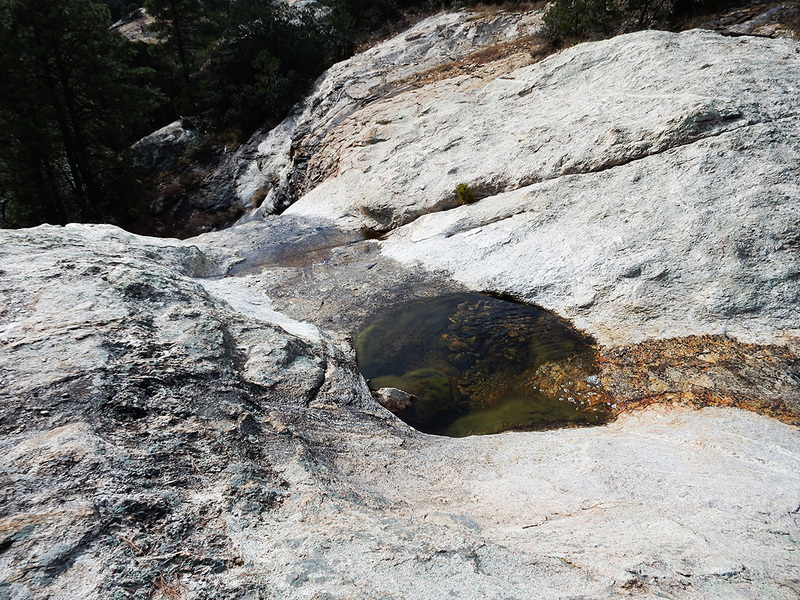 At Devil’s Bathtub, we filled our bottles and bladders, ate lunch, and napped again in the warm rays of the sun on the gently sloping granite at the top of the falls. We didn’t go to the bottom of the falls, as we just didn’t want to do any more climbing than we had. After about an hour and a half, we made our back on the correct route to Spud Rock Spring. Cool, clear water at Devil’s Bathtub. As evening approached, we prepared dinner and built another roaring fire. The temperature dropped, but it was still comfortable. Ryan threatened to make a jacket out of, you guessed it, aluminum foil. Joe and I convinced him that he would be better served by just climbing into his sleeping bag. The skies overhead were clear, with no wind whatsoever. We began to doubt any arrival of rain during the night. Too, no other campers appeared either, though around 8 PM both Joe and myself thought we heard voices in the distance, but we never saw any lights or smelled smoke from other fires. About that time, we called it a night. The rain came at 1:45 AM on Sunday. It drizzled most of the night. Joe and I stayed dry, but neither of us noticed that Ryan had not put a rain fly on his tent, so he got a bit wet. By the time we got up at 7, the rain had abated, allowing us to eat some breakfast bars and break camp without too much fuss. We made our way out at 8:25 AM. 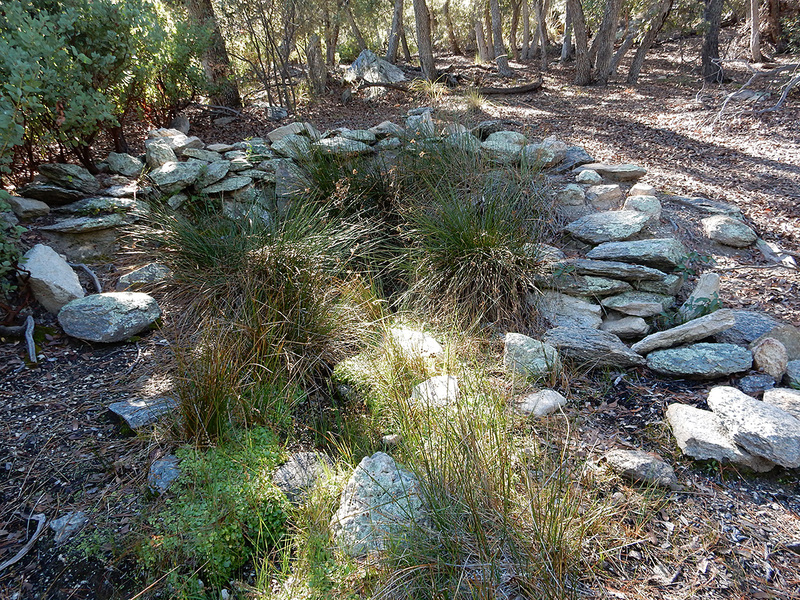 To make your way in or out of Spud Rock Spring, you climb a small ridge. As we went over and down that ridge, we came across 5 women in 3 tents in the area of the poor trail marking/overgrowth/felled trees. These were the hikers that held the permits for the other 2 sites, and the ones we had heard the night before. They had fought their way up the Turkey Creek Trail the day before, only to be stymied by the poor trail conditions and impending nightfall. 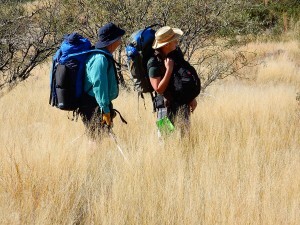 The apparent leader walked over to us, inquiring about our campsite and water, as they had run out and were in the process of collecting what they could off their tent rainflies. Then, as panic set manifest itself in her eyes, she said “Perhaps this wasn’t the best trail or time to bring a couple of newbies on.” I think some friendships were damaged that day. Looking back up at the Spud Rock Spring area as we made our way down the trail. We made our way down through almost constant drizzle in four hours, without slipping and breaking anything. It was actually a pleasant experience. Sunlight shone upon us for the last mile, allowing us to dry somewhat before getting into the Jeep. 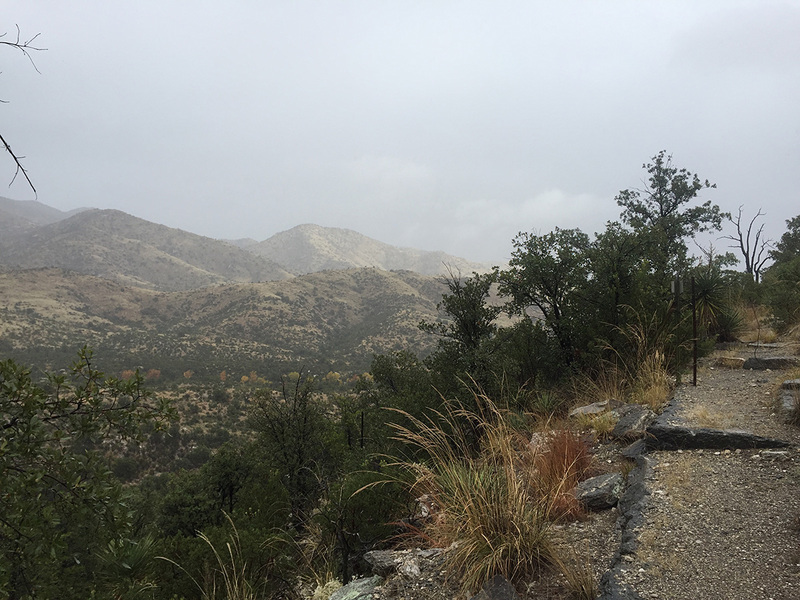 Rain drizzles as we descend the trail into the lower foothills of the eastern Rincon Mountains near Miller Flat. We enjoyed a late and large lunch at Reb’s Café in Benson before heading back to Tucson. QUESTION: Why is Spud Rock Spring not even close to to Spud Rock? They are not even on the same ridge. GEAR NOTES: I had checked out my old Coleman Peak 1 gas stove (dating back to 1982) last May, and it worked fine. When I tested it out before this trip, it was evident that it had developed bad seals, because the flames were burning yellow, and I couldn’t get new parts in time to rebuild it for use on this trip. So I bought an Optimus Crux Lite canister stove and the Optimus Terra Solo Cook Set. A small canister sits inside the cook set, along with the stove, and the cook set comes with a mesh stuff bag that doubles as a scrub cloth. The stove worked perfectly, and the cook set was just right for what I needed (making hot drinks and boiling water for instant oatmeal, a pouch dinner, and clean-up). I also needed to get some shelter at the last minute. An offer of a borrowed bivy did not come through, and I didn’t want to pack my Mountain Hardware Optic 3.5 up the mountain, so I ended up getting a $39.99 1 person tent at Big Five at 8:55 PM on Thursday night. It worked great. It’s actually pretty well made for the price, with a generously sized mesh side panel to get in and out of, mesh panels on the other sides, a rainfly, and a fitted footprint. It was vented well, and I didn’t get any condensation. 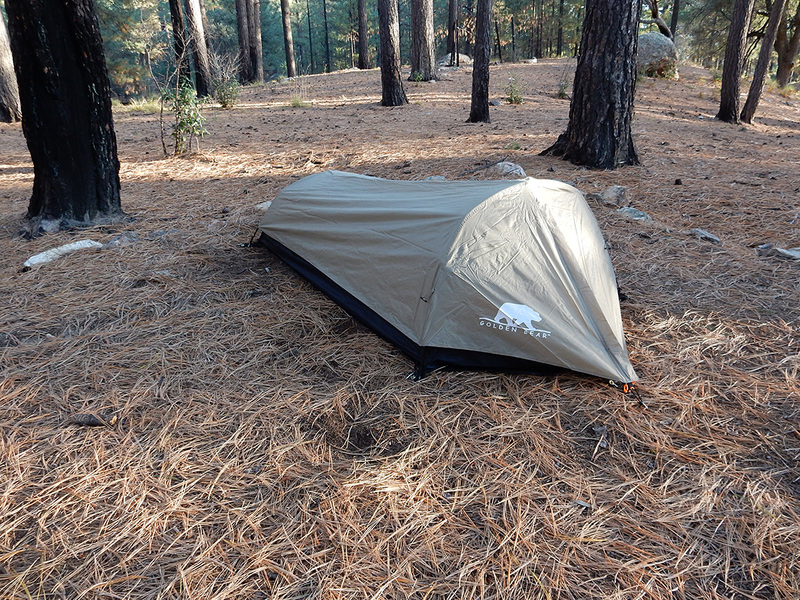 Both the tent and rainfly have good zippers, reinforced tie-down points, and the weight is 3 pounds. The factory sealed seams did not leak in the rain. Not a bad deal for back up or light duty bivy. Branded “Golden Bear”, one of the Rec-Out brands (Rugged Exposure, Columbus).